KnittedKnockers.org is a US-based website which connects volunteer knitters with breast cancer survivors all around the world to offer free ‘knitted knockers’ to any woman who wants them. The Knitted Knockers are special handmade breast prostheses for women who have undergone mastectomies or other procedures to the breast. They are soft and comfortable and when placed in a regular bra they take the shape and feel of a real breast. Knitted knockers can be adjusted to fill the gap for breasts that are uneven and easily adapted for those going through reconstruction by simply removing some of the stuffing. On the website women can request a knocker in the size and colour they want. The website also provides patterns to knit or crochet knockers. You can explore the Testimonials page to see how knitted knockers have affected others or look up the Knitter Registry/Directory to find your closest knitter. Providing free knitted knockers in Northern Ireland and the UK. To order free breast forms email knittedknockersofni@gmail.com. 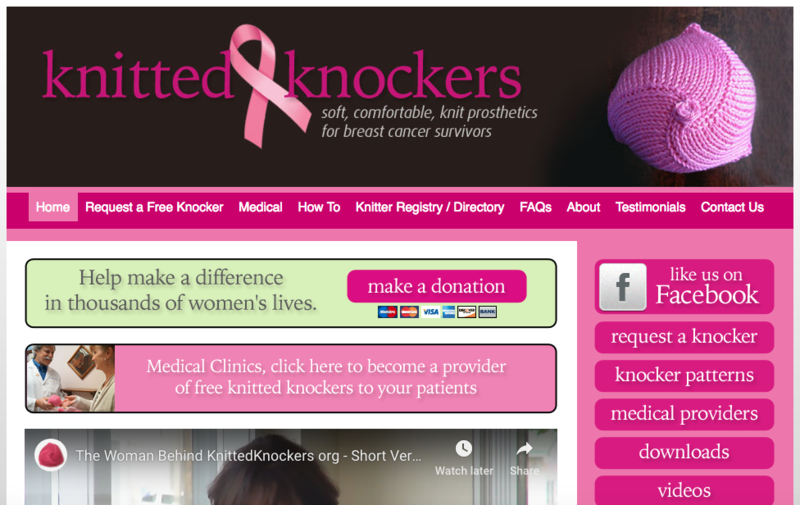 Knitted Knockers are Physician Approved and the FAQs page also has a lot of further information if you have any questions. Visit the Knitted Knockers website here. Previous Post Welcome to our new daily subscribers – we’re so glad you’re here! My only regret is I wasn’t more adventurous when I selected the colour and pattern!